According to a new study led by researchers at the Australian National University, extensive cave systems under an active volcano on Ross Island in Antarctica could harbour a secret world of animals and plants. The caves, which are hollowed out by steam from the volcanoes, are light and could have temperatures as high as 25 degrees Celsius (77 Fahrenheit) within. Lead researcher Ceridwen Fraser said forensic analyses of soil samples extracted from some of the caves had revealed intriguing traces of DNA from small animals and other organisms. While most of the DNA was similar to mosses, algae and invertebrates found elsewhere on the continent, some sequences could not be fully identified. "The results from this study give us a tantalizing glimpse of what might live beneath the ice in Antarctica -– there might even be new species of animals and plants," she said. "The next step is to go and have a really good look and see if we can find communities living beneath the ice in Antarctica. 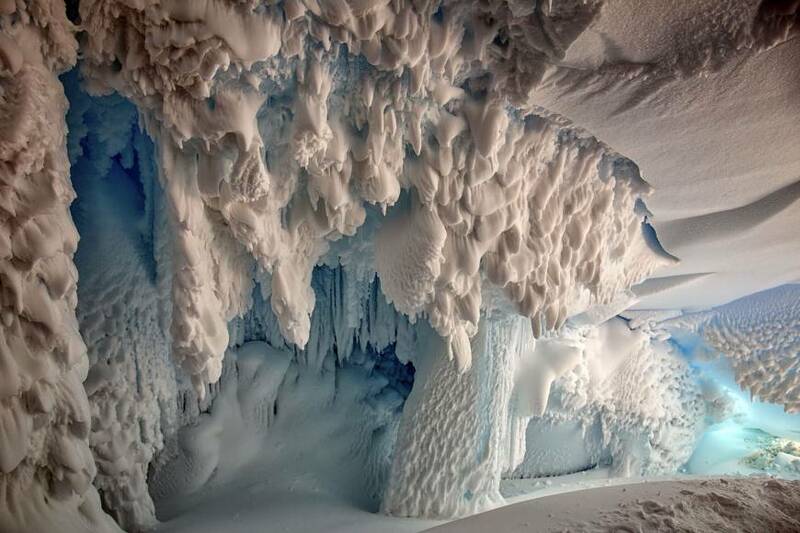 ""We don't yet know just how many cave systems exist around Antarctica's volcanoes, or how interconnected these subglacial environments might be," said co-researcher Charles Lee from the University of Waikato. "They're really difficult to identify, get to and explore."